Here at AED Roofing and Siding, we install, repair and replace rain gutters, soffits, and fascia. All three of which are in place to help protect your home, from water, mold, insects, and critters. 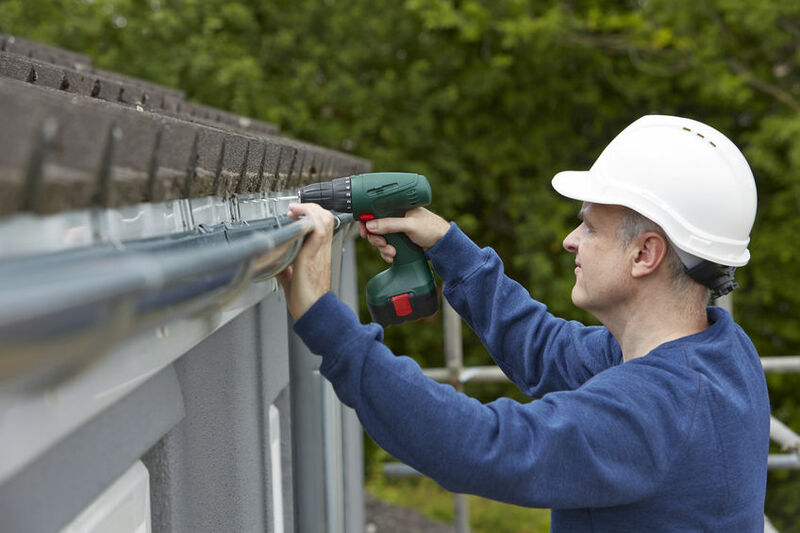 ​ As you read more below, you'll understand why it's important to look into gutter installation if you don't have them. If you do, you'll find why gutter cleaning is also an important task in home maintenance. The soil that surrounds your home expands and contracts with weather. This is the number one reason for slab failures in your foundation. After one of our afternoon storms here in Virginia Beach, the soil around the exterior of your house expands when it becomes saturated with water and moisture. Then a dry, hot day following rain can cause the soil to contract and pull away. When this cycle repeats over and over, your home's foundation can be compromised leading to cracks in the foundation and masonry and things like sticking doors and windows. A gutter system that is properly designed, installed and maintained keeps the ground surrounding your home at a consistent moisture level as it directs water run-off away from the house. When rain water flows off an unguttered roof it hits the ground with a lot of force causing splash-back. This splash-back holds in to minerals, grass and dirt that get stuck on your home's exterior. Sometimes this can cause stains that can be hard to remove. When you have an unguttered roof your landscaping can be damaged by the frequent thunderstorms that come through Hampton Roads. Over watering that comes from the storms can affect your flowers and plants causing fungus, but it can also attract nasty termites, ants or roaches. ​Downspout too close to the foundation. Soffits and Fascia are part of the roof closest to the roof line and the gutters. Soffits are the eaves under the roof line, or overhang of the roof. Fascia is the wood piece that is between the edge of the roof and the outer edge of the soffit. Soffits and fascia are usually the first place to succumb to water damage from shingles gone bad, flashing, faulty gutters or by ice and snow. Damage to soffits can also be caused by birds, squirrels and other critters nesting inside the eaves, who are attracted to an already wet environment because it proves less resistant to their chewing or pecking. Replacing or wrapping the soffits and fascia can be beneficial to keeping your roof in good shape but it also benefits your home's curb appeal. Not only that but you can say goodbye to the constant upkeep and painting of the old wood. Get in touch today to discuss how we can help you. Gutters, Soffits and Fascia are put in place in order to protect your home from things like water, mold, insects and critters. You know what to do now - fill in the form, or just pick up the phone and call us!